SKU: N02-E1 Categories: Information on pregnancy?, Information on caring for a baby?, Information on caring for young children? Second-hand smoke is a mixture of exhaled smoke and smoke that comes from the tip of a burning cigarette, pipe, or cigar. Scientists have found more than 4,000 chemicals in second-hand smoke. They include nicotine, carbon monoxide, ammonia, formaldehyde, dioxins, and furan. Most of them come from the burning of tobacco (combustion). Most people know that smoking is a health risk and that second-hand smoke is harmful. But smoking sometimes has a social impact as well, with friends and family who don’t like to visit, or who may even argue about smoking. This video is for new and future parents and for everyone who shares their environment with children, even occasionally (relatives, friends, babysitters, etc.). It offers real stories by people who have experienced some of these social effects. 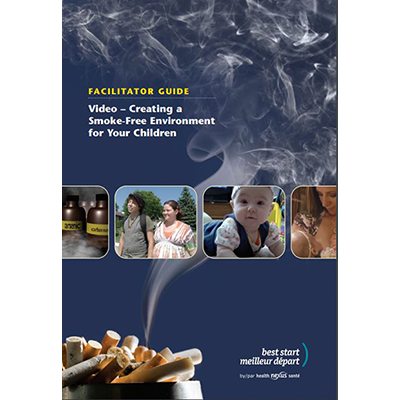 The purpose of the video is to discuss the social impact of second-hand smoke on young families and to explore strategies for helping to reduce or eliminate this impact. Many strategies to reduce the exposure of young children and pregnant women to second-hand smoke are provided. Also available in French and in an Indigenous adaptation. See also Information on Second and Third-Hand Smoke, a handout in English and French.